You are invited to a public gathering to pay tribute to Beth Brant (Degonwadonti) – her life and her groundbreaking work. 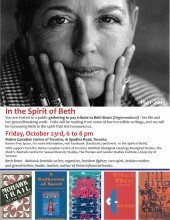 Folks will be reading from some of her incredible writings, and we will be honouring Beth in the spirit that she honoured us. Barrier Free Space. For more information, visit Facebook (facebook.com/Event – In the Spirit of Beth). With support from the Native Canadian Centre of Toronto; NishDish Aboriginal Catering; Aboriginal Studies, The Mark S. Bonham Centre for Sexual Diversity Studies, The Women & Gender Studies Institute, University of Toronto. Beth Brant – Mohawk feminist writer, organizer, freedom fighter, two spirit, lesbian mother and grandmother, healer, teacher, author of these influential books.